World demand for well stimulation materials will grow more than 12 percent per year to over 65 million metric tons in 2017, valued at $23 billion. Both proppants and chemicals will grow at similar annual rates. The US will remain the dominant market while demand in Canada, China, Russia and other countries will grow at a faster pace. 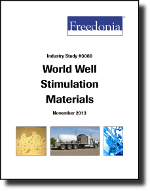 This study analyzes the 36.8 million metric ton world well stimulation material industry. It presents historical demand data for 2002, 2007 and 2012, and forecasts for 2017 and 2022 by type (e.g., raw sand, coated sand, bauxite-based ceramic, clay-based ceramic, gases, acids, gelling agents, crosslinking agents, breakers, friction reducers, corrosion and scale inhibitors, biocides), world region, and for four key countries. The study also considers market environment factors, details industry structure, evaluates company market share, and profiles 52 industry players, including Fairmount Minerals, CARBO Ceramics and Momentive Specialty Chemicals.